Today in Burkina Faso, more than 29% of children under age 5 have suffered from a form of malnutrition called stunting. Because they didn’t get enough nutritious foods in the womb and through their first 2 years of life, they are more prone to disease, poor school performance and difficulty when they enter the world of work. Stunting can be permanent, but it is preventable. 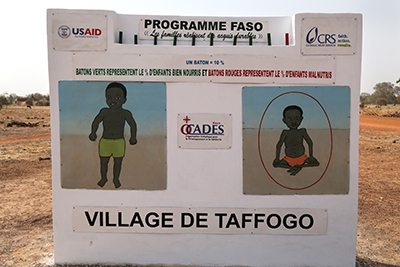 Through Families Achieving Sustainable Outcomes, or FASO, funded by USAID's Office of Food for Peace (FFP), CRS focuses on preventing malnutrition for children under 2. The goal is to provide a healthy start and teach parents how to maintain their children’s good nutrition and health. “Ever since the FASO program, we’ve talked about the big problems and how to solve them. Since FASO began, I’ve noticed a lot of changes,” says Mamounata Pafadnam, a “care group” leader and mother. In Burkina Faso, food is generally available in local markets, but chronic poverty or natural disasters—such as drought—can reduce food availability. CRS and our partners help communities increase the supply of nutritious food. We provide better seeds and training in farming and food production techniques. Communities also learn how to protect their land and soil. For example, FASO supported a women’s group in producing local fortified flour for infants and setting up a distribution and marketing network. Improving local sources of nutrition provides affordable food and grows the local economy. But increasing the supply and affordability of food isn’t enough to end malnutrition. Communities also need to learn good health, nutrition and hygiene practices. CRS applies the care group approach to help mothers lead the change. 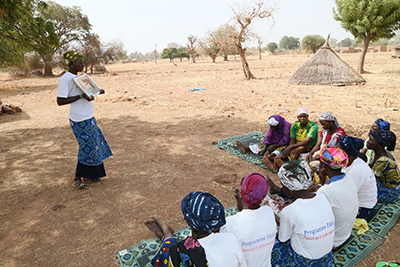 Care group leaders—also called leader mothers—in each village reach out to pregnant women and new mothers. They promote exclusive breastfeeding, demonstrate proper nutrition for infants and promote better access to health care for pregnant mothers and children under 2. “I pleasantly noticed that since birth, my child, who is more than 6 months old, has been sick once and it was not a big deal. I concluded that this is due to exclusive breastfeeding. As the baby can eat now, I introduced the enriched infant porridge. Compared to other children, my baby has grown up well and looks good. I’m happy,” says Téné Sawadogo, a mother who participates in the FASO program in Boulsa health district. Community members are encouraged to hold one another accountable for improving health. One way of doing that is through a community scoreboard—a tool that tracks a community’s progress in achieving health indicators. These scoreboards engage the public in health efforts, and friendly competition may push communities to better results. “Having the scoreboard reminds us there is still a problem to address. We’re still facing challenges. The scoreboard is our motivator and reminder. There are still women who don’t practice exclusive breastfeeding during the first 6 months. We need to work. Even if we can’t get rid of all the red [on the scoreboard], we can reduce it,” says Tiga Ouedraogo, health promoter. In addition to food and health education, CRS and its partners are improving access to safe drinking water and addressing community sanitation. Constructing facilities and communicating messages about water, sanitation and hygiene both play an important role in ensuring good nutrition and reducing diarrhea and infections. Before the FASO program, open defecation was common in many villages: There were no latrines. Besides lack of privacy, people had to worry about being bitten by snakes or other animals while relieving themselves. Rain spread the human waste, and disease was common. Now that people know the risks of open defecation, they are making changes in dozens of villages in Burkina Faso. And masons have been trained to build latrines for communities and families. Numbers show the cost of hunger—and the benefits of using knowledge to achieve better results. For example, it’s estimated that hunger costs Burkina Faso more than $800 million per year. Malnutrition costs are evident in health care, education results and worker productivity. Some 7.7% of the country’s gross domestic product is lost to malnutrition, according to some estimates. But the following numbers tell a hopeful story of Burkina Faso: At least 600 latrines have been constructed in 36 villages, and more than 16,500 individuals in 55 villages now have potable water. “Children are cleaner. Latrines are washed regularly. People visit health centers more regularly. As group members, we do our part to share information outside the group and encourage other women to join the group,” says Mamounata. 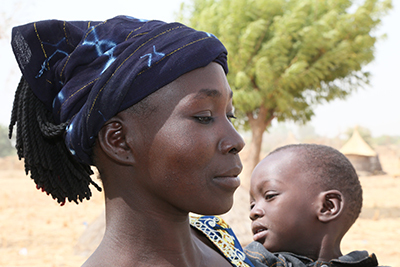 In Burkina Faso, the story of stopping malnutrition and stunting is not only told by numbers. It’s a developing story told best by its citizens’ actions. For more information about CRS' nutrition and health programming, click here.